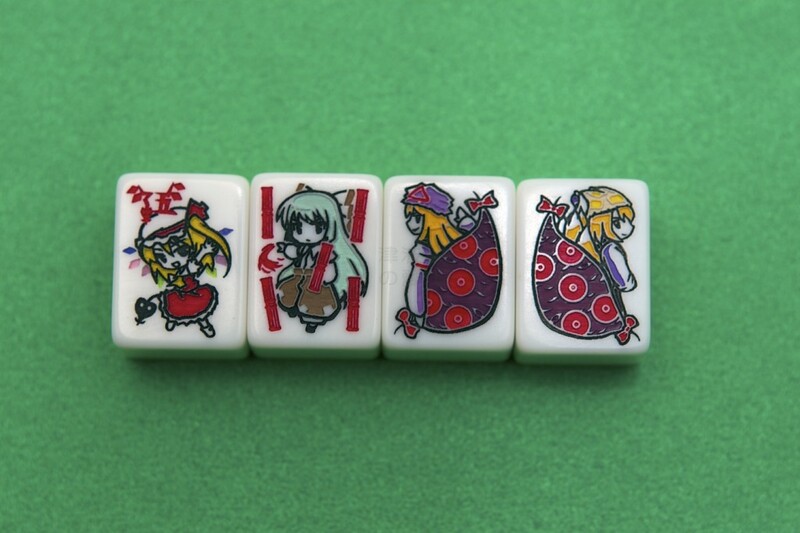 In the world of gaming there are only two things that consistently make me happy: Touhou and Mahjong. Each of which I could devote a review to, though I have a feeling they would quite long and arduous. 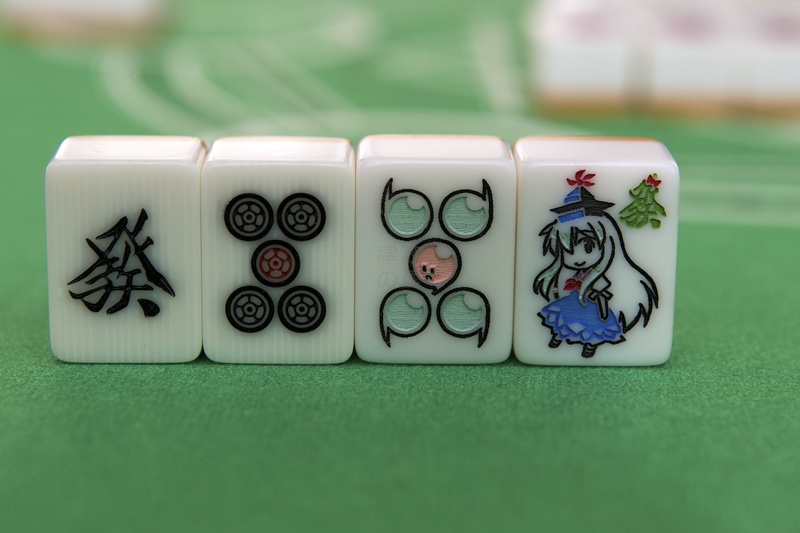 Imagine my delight when I discovered that someone in Japan felt my desires too and produced a high quality, fully legal Touhou mahjong set. Now, not only could I have my cake, but I could have Touhous on my mahjongs! Oh, and I could eat the cake too. 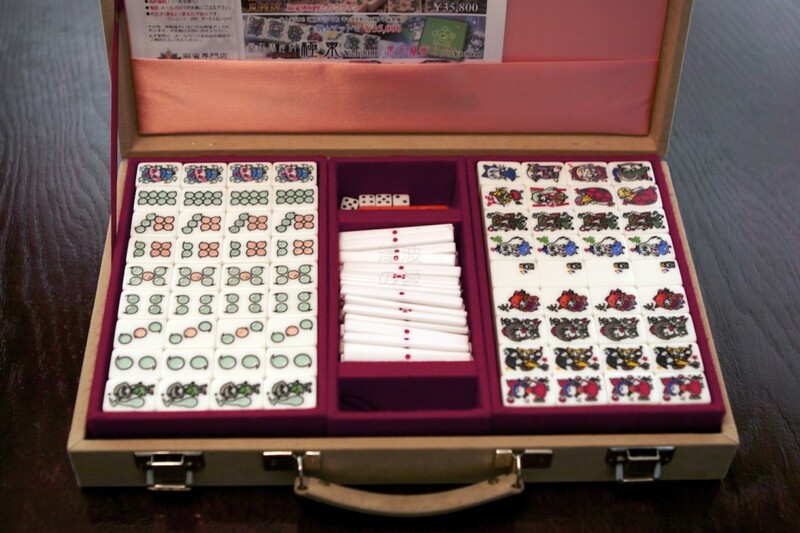 So late last year, I was poking around the internets looking for a certain kind of mahjong set. If you don’t know what mahjong is, it is a game played with a set of tiles that is very popular in the old Asia country. In the anime Akagi, which is a show about manly men, doing manly things, which amounts to playing a lot of mahjong and being gar about it, there is a climatic battle of wits that requires a certain kind of set. 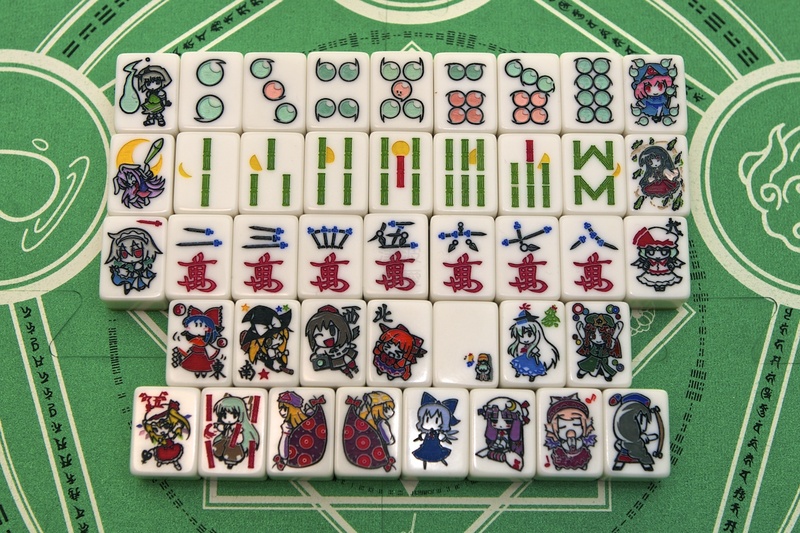 That set, known as a Washizu no Mahjong set, named after the antagonist who thought it up, has 75% of its tiles as clear so you can see what your opponents have in their hands. Now there have been several attempts at making this set, one notably in Canada, but from what I had read, they weren’t very good so I was looking for something with more legitimacy. Somewhere along the line I was directed through a set of obscure links, mostly in japanese, and landed on a site in pure japanese which had just such a set, hand-made, and for a modest sum. Just as I was getting excited about having found my quarry a link above the clear set caught my eye. Upon the tiles of this other set were tiny figures which I immediately recognized. “Touhous!” I exclaimed, and forgetting my search, I went to there. How could you not want to go to there? Now, I know what you’re thinking. Why on earth would you care about a silly tile game with silly girls on it in silly hats instead of, you know, anything else? First of all, because mahjong is awesome. Second and third, because Touhou is awesome and shut up. Really though, I love Touhou, not so much for its games, which are alright on their own, but for its enormous fan base and its creator’s nonchalant demeanor toward derivative works. As such, so much creativity comes spewing out of the Touhou fandom that I can’t even keep up (just the size of in-game music remixes alone in the last five years is around one terabyte). For all of this fandom, all I’ve really had access to is digital: Some pictures, music, and the occasional comic. I had yet to get anything physical from the fandom. But thankfully, with this find, that would change. 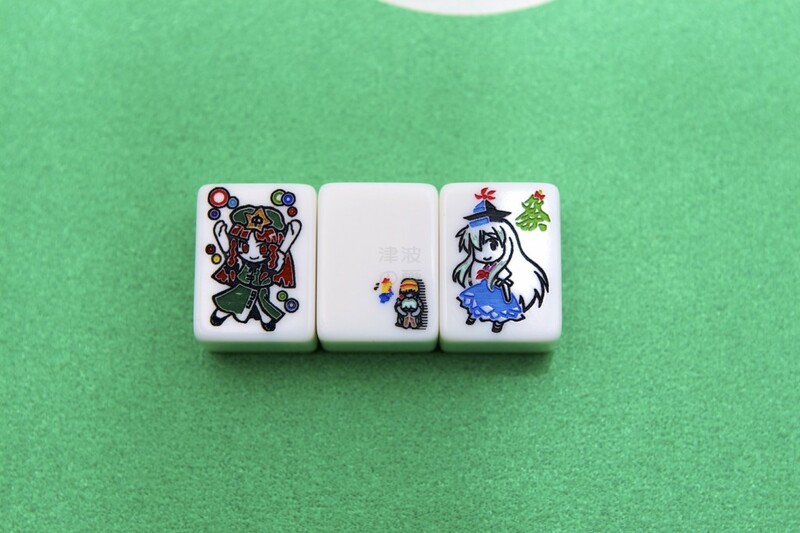 The other reason I was excited was that while I had seen Touhou mahjong sets before they had always been blank tiles with stickers on them or in rare cases screen-printed on. This set had been engraved and painted by hand. 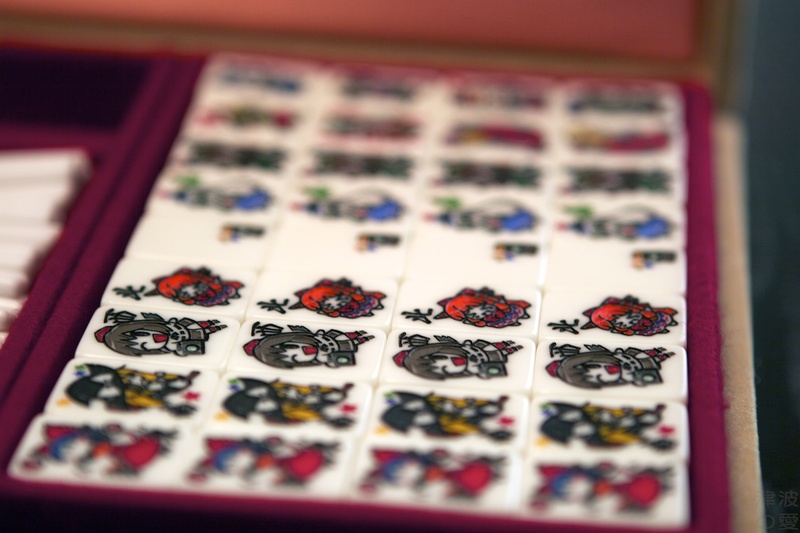 Not only that, but they were the size used in pro league mahjong tables so they would work in an automatic table and had the same weight that pros use. And it was a dedicated set for riichi rules. All these combined is a one in the internet find. By contrast, All the stickers..
After procrastinating for six months due to its cost (custom fan tiles ain’t cheap) I finally sucked it up and took the plunge, emailing the company directly to ask about shipping and payment since they were in Japan and I wasn’t. As it turns out, Japanese companies seem to think the best answer is no answer when they don’t have a favorable response for you. I ended up having to go with an intermediary to buy it for me and ship it once they got it. Due to this and the fact that the yen decided to get stronger in the months I waited it ended up costing a bit more than I originally anticipated. However, three weeks later (they had to make it) they shipped it to the states and in only four days I had the combination of my two silly hobbies in my hands. And so, here are a bunch of pictures with some comments! The set ended up coming in a case with the normal felt trays and dividers. The case itself was plush on the outside like velvet with a nice padded handle for carrying. I’m not sure about the velvet though. It would probably get pretty filthy if I traveled with it much. It also came with four dice, a nice solid and weighty wind marker and a little bonus I’ll get to later. Here are all the tiles. Starting top left: dots, honors, characters and bamboo. This is a better look at the individual tiles as a group on their own: dots, bamboo, characters, winds and dragons, red fives and seasons. 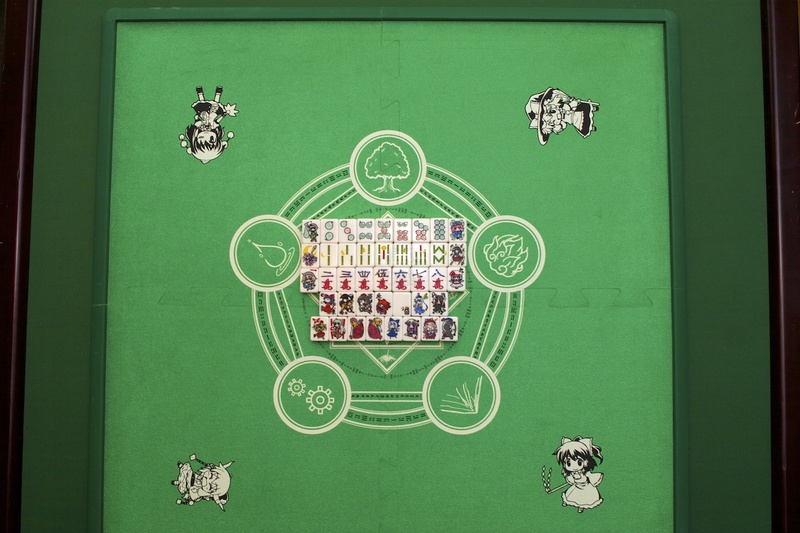 As you can see each set was done with a motif corresponding to a group of Touhou characters and a specific game, or maybe you can’t and can now see with better detail how weird I am. Dots are the ghosts from Hakugyokurou (Perfect Cherry Blossom) . Bamboos are unsurprisingly from the bamboo forest (Imperishable Night). And Characters were done with knives from the Scarlet Devil Mansion (Embodiment of the Scarlet Devil). These are the terminals for the number tiles. The terminals are more detailed than the simples in their set. For dots (left) we have Youmu as the 1 and Yuyuko as the 9. For bamboo (center), there’s Reisen for the 1 and Kaguya for the 9. 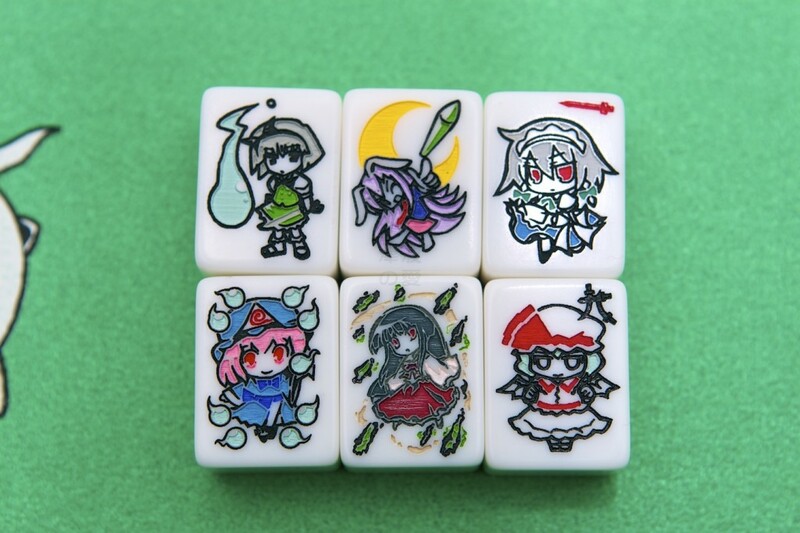 And for the characters (right) there’s Sakuya for the 1 and Remilia for the 9. The terminals followed a nice pattern with the servant as the 1 and the master as the 9. Subtle things like that make my day. Here are the winds. Again, unsurprisingly, Reimu is east. Being the main character of the games, she should obviously be on the 東 when the series is 東方 (touhou). South is Marisa, west is Aya, and north is Suika. I’m not sure if there are any on the nose references with those assignments or not, though Aya as west feels right somehow. The only thing I’m not sure of here is Reimu. The tiles were clearly done each by a different artist, which is typical of fan circle works. Whoever got Reimu gave her an odd face which is unlike any fanart style I’ve seen before. Ah, the red fives. It wouldn’t be riichi without them. These are a really nice touch I think. In Touhou there are extra stage bosses that are super hard and are only unlocked when you beat the game on normal in one go. I already said that each number tile set had a motif which corresponded to a specific game. Well these are the EX bosses from those games. 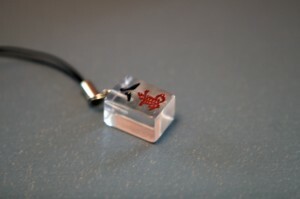 Flandre is the characters’ red five. Mokou is the one for bamboos. 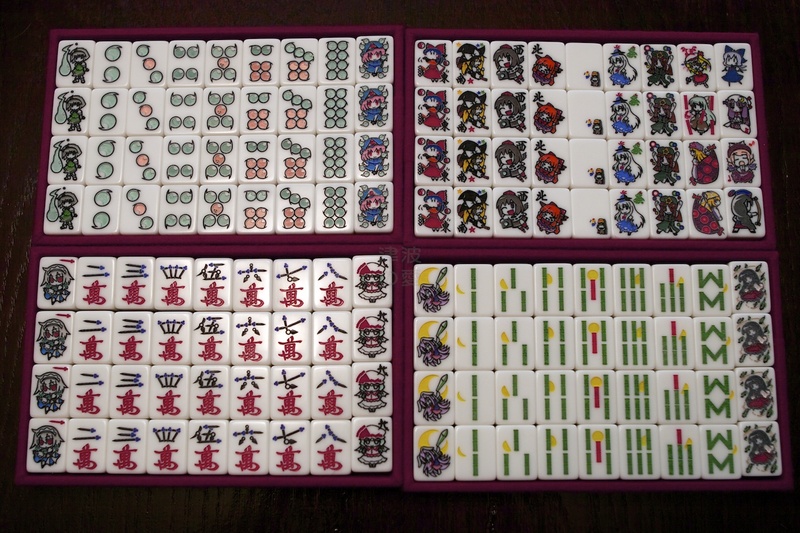 And since dots always have 2 red fives in a set we have Yukari and her shikigami Ran for those. I especially like how they used the eyes in Yukari’s gaps to be the dots and how ran and Yukari are facing back to back. That’s really nice. Finally, we have seasons. The clear winner here is Cirno the ice fairy as winter. That they got Dioxin, the artist who did the “Atai” series of 4komas, to do her art is even better. Patchouli is spring, Mystia is summer, and Eirin is autumn. I don’t see too much correspondence there, but whatever. I don’t play with seasons so not getting to use Cirno is kind of a downer. Here is a comparison between these tiles and my faux-ivory set. 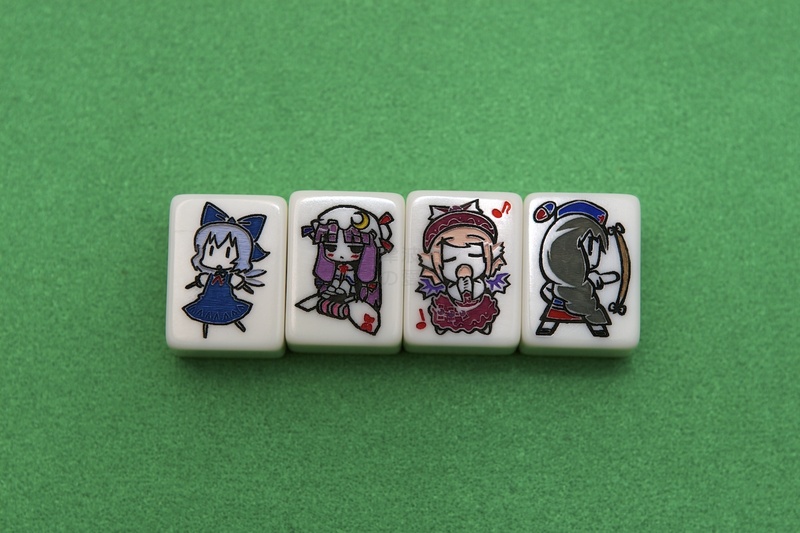 The Touhou tiles are ever so slightly taller and their backs are not rounded which will make building walls less tricky than with the others. You’ll also notice that on the five dot tile, Myon has a little frowny face. Aww. They also threw in this cellphone bobble. Too bad I’m not Japanese enough to have a cellphone bobble collection. 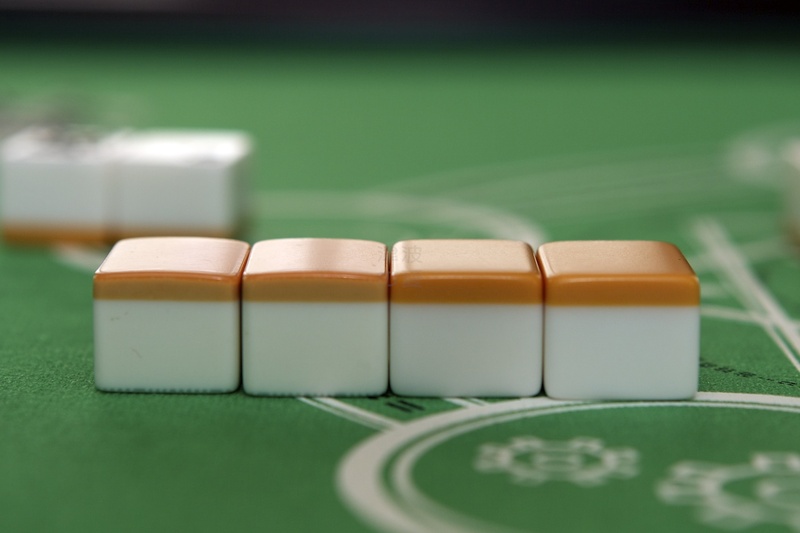 You might have noticed the surface I took these pictures on is not a normal mahjong table. If you did, you get a cookie. 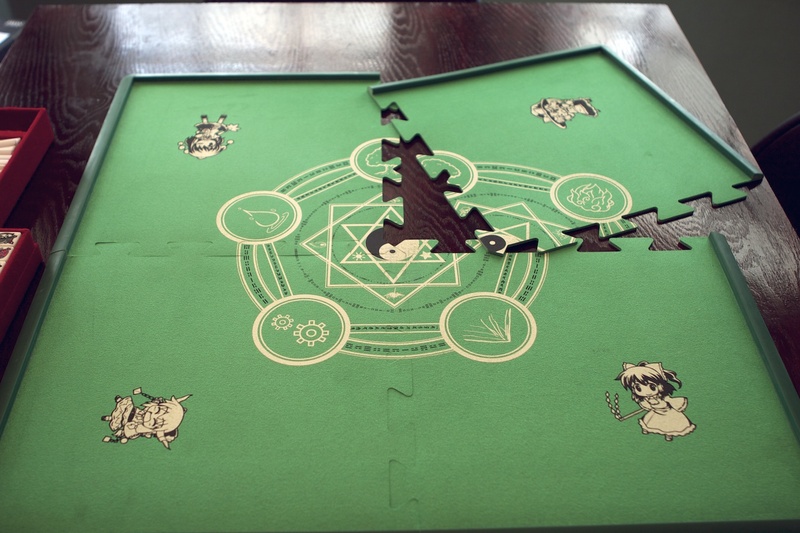 This set was bundled, if you chose, with a “junk mat” which is a portable mat you can take with you to play mahjong on any kind of table. Tiles can damage and be damaged by hard-surfaced tables and so a nice soft cushion is nice. Junk mats also give you a lip around the edge to allow for easier stacking of tiles, like on a normal mahjong table. My table at home has a layer of felt over a rubber pad. Most junk mats I’ve seen online are pretty flimsy; usually made of thick cardboard with some felt glued to it and a plastic lip that you slide onto the edge once built. I figured this was the kind of thing I’d be getting with the bundle. Again, Japan fans prove that they take their craft seriously. 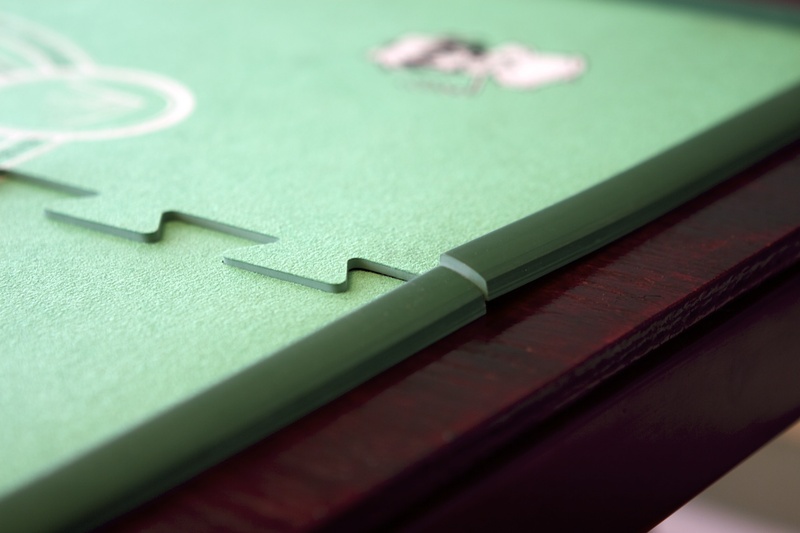 The mat actually comes as four sections of rubber with a felt layer fused to the top. Each section is one piece, the lip and the bottom forming a continuous section of rubber. The sections fit together like a puzzle and when joined the seems are not noticeable. You can really see how thick the rubber is. It’s really durable feeling. Each section weighs probably between a third to a half a pound. 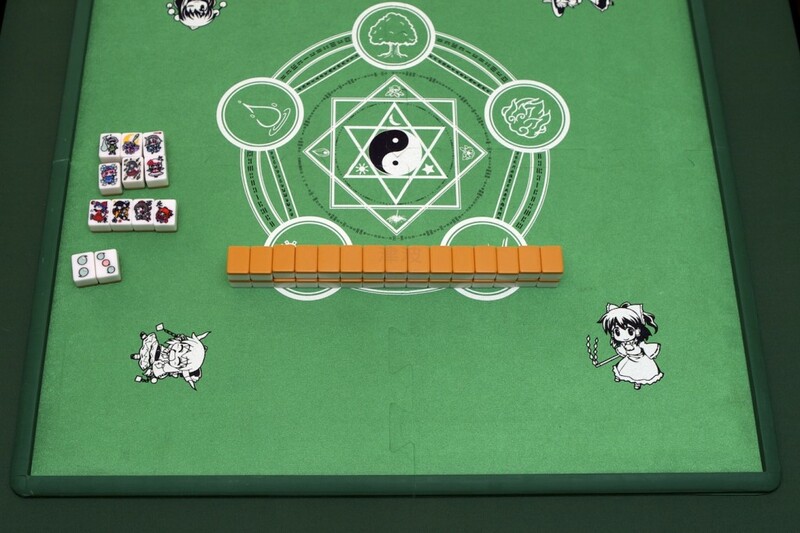 Here you can see the size of the tiles vs the size of the mat vs the size of a regular mahjong table. It’s about 3 inches smaller than the table on each side. This might make ponds a tight squeeze, but I think it’ll be doable. There is only one thing I would have liked, aside from the yen being weaker when I ordered it. The store sold the tiles with both tan and blue backs on them. When I told the intermediary to buy the bundle, I requested the blue backs. I don’t know if that wasn’t communicated or if the store didn’t have any blue backs lying around, but when I got the set, I couldn’t help but feel just a little disappointed. Oh well, the quality of that mat made up for it. Overall, I’m really thrilled to have this set. As far as I know, I might be the only person in this hemisphere that has one (or wants one). I can’t wait to play with it or show it off, depending on how clean everyone’s hands are. If you want to get your own, links are at the bottom. I also own this set. I would keep it for display but I much prefer actually playing with it. People who haven’t seen it before (especially Japanese people) are usually quite impressed with it, if not flabbergasted. I can’t say enough about the construction quality of the tiles, the engraving, their weight and feel. 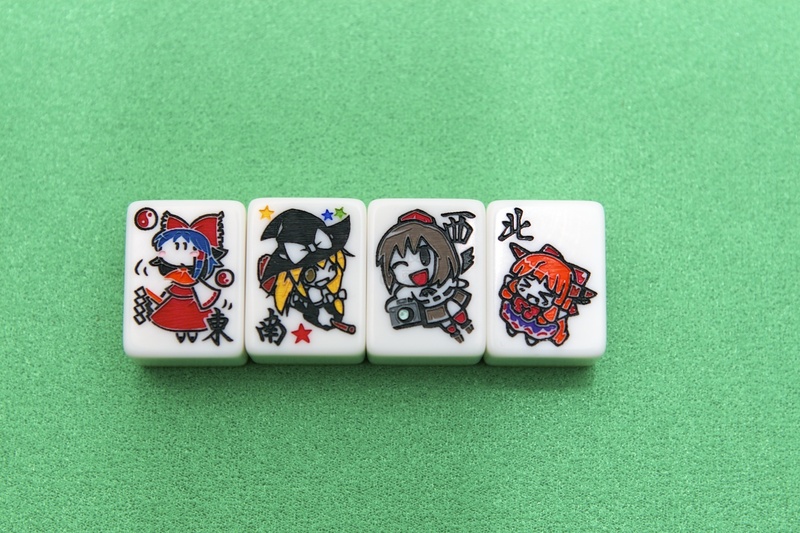 As a fan of both Touhou and mahjong, this is a dream item. Hakutaku are symbols of luck, so Keine has been assigned as the green dragon as she’s a were-Hakutaku. This is really a great set. Late to the party, but i love this set! Thanks for providing links to the storefront and importer.